The Poetry Foundation by architect John Ronan is in itself poetic in the way ones moves through the building’s material layers of zinc, glazing, and wood. One has a constant view of the heart of the building; the courtyard garden. The courtyard garden nourishes poets through audio performances of their work. 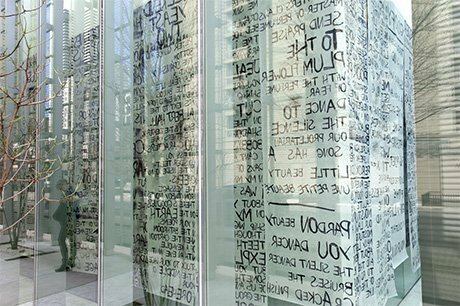 One of the main conceptual issues raised by the project was how the architecture would physically display poems in a world moving towards digital displays. Within his exert Digital Culture in Architecture, Antoine Picon states “With the increasing importance of electronic media, it in attempting to transform architecture into a giant information display”. The reading later goes on to the example of Time Square. The Poetry Foundation did not want a showy building driven by political status, they wanted to steer clear from a digital-architecture like Time Square and more towards subtlety. The building takes on this issue by storing the poems in a two-floor wooden bookcase that is visible upon entering the building instead of a digital display (seen in figure 1). This book shelf wall is like Time Square in that only the book titles are on display, in Time Square only the news story titles are on display. If one insists on looking further into a poetry book they can open the book while at Time Square one can google search the news title on their smartphone. 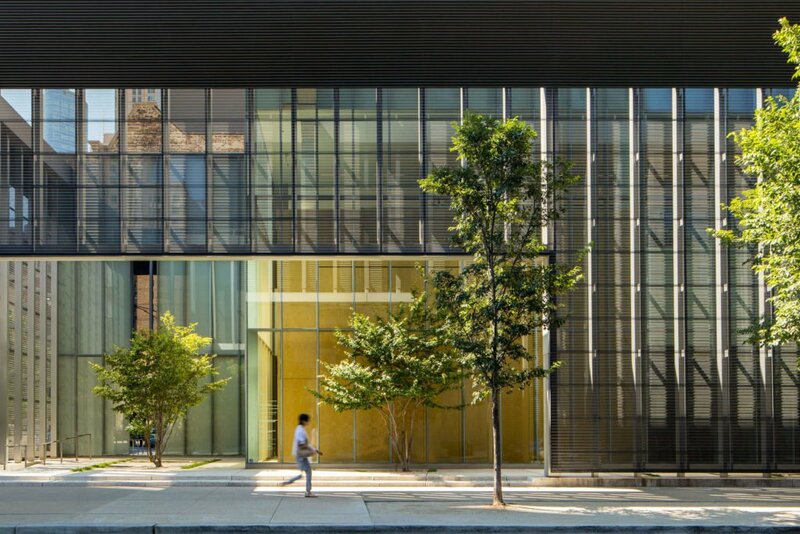 The Poetry Foundation has built their first building, while before they had to rent out places throughout the city to store their library of over 30,000. The Poetry Foundation has always been on a low-budget until philanthropist Ruth Lilly donated $200 million to the foundation in 2003. John Ronan Architects were chosen after a competitive deliberation to choose the correct architect. The requirements were to create a poetic architecture to house, share and create poetry. One of the main reasons that John Ronan architects were chosen was because of their non-affiliation with political influences (Broome). This separation from political influences helped create a poetic building with intentions not to store, but house the creative collection in a nourishing way to the visitors and poems themselves. The issue was to create an architecture that was not a “hubristic palace” for people of the foundation but instead to house a wealth of creativity for the community. The building is 26,000 square feet, part of which is the 4,000-square foot garden that is completely incorporated into the program of the building due to its central location. The clients request for a garden space was unique, Ronan used this as a driving feature in the design. Ronan made the garden space a void that is cut out of the North-East corner of the building (seen in figure 2). The space is adjacent to the sidewalk and open to public which blurs the line between public and private (seen in figure 3). This idea of public use of the building was a main aspect of the design that the garden helps drive. The garden acts as a place where poets can grow their skills as they read their poems out loud and cross-pollinate with fellow poets. The space acts as a haven from the busy downtown sidewalks while the zinc panels blur the action, hustle and chaos of the street beyond. In the book The Function of Ornament, Moussavi explains how “the architect’s role is becoming increasingly specialized in the design of the outer shell” (6), which holds true for the Poetry Foundation as it was built more recently in 2011. The outer shell of the building is made of perforated, corrugated oxidized zinc metal panels that give the building its crude aesthetic (seen in figure 4). Ronan chose this material because of its generic nature. Like poetry that uses generic words, what makes the poetry and architecture profound is not the individual words, but the way that the words or materials are composed together. The perforated metal skin acts as a veil adding a feeling of protection for the inhabitants while allowing them filtered visibility. 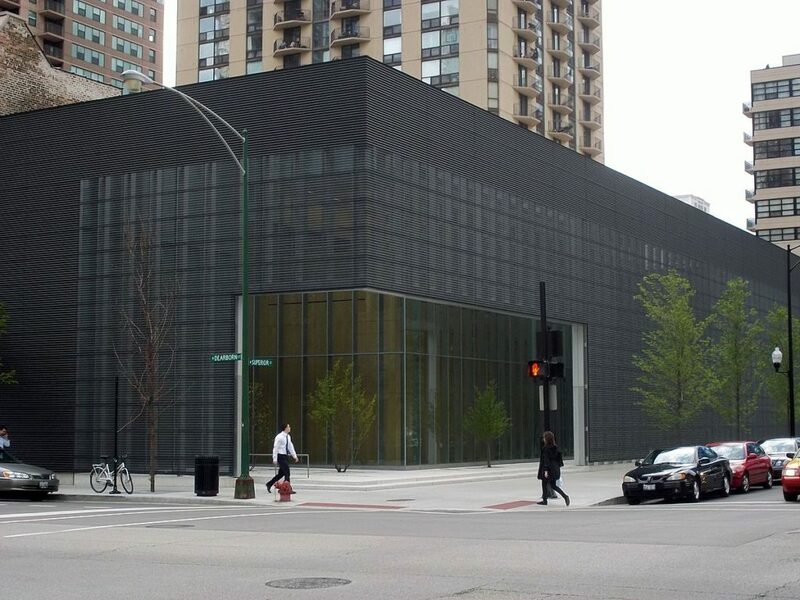 Some of the board members thought that the perforated oxidized zinc metal envelope would look like a parking garage. The clients did want a building that would not be a spectacle. Ronan could get away with more risky design decisions such as using this material because his clients were creative people themselves. John Ronan explains the movement through the building as unravelling like lines of a poem. The layers of perforated metal, glass and wood organize the spaces and are composed in an elegant yet humble way (seen in figure 5). The materials Ronan chose are simple yet meticulously crafted like words of a poem. For instance, the use of concrete is generic yet Ronan spent three months getting the concrete mixture to be mastered to the right shade and texture. The project became less of a job that had to be done and more a craving for further architectural harmony. The building shapes the way for future post-digital architecture. Computer use was a tool rather than a design realm of itself. The building is humble and subtle in its gestures towards an architecture that does not distract its inhabitants from the poetry itself, yet enhances poets in their ability to create and share their work. Antoine Picon, Digital Culture in Architecture, (2010): 84. Next articleHow to Find and what are the Top 4 Kinds of Prefab Homes?